Please join us for the first of our members' events and our anniversary lecture. Both will be interesting and relevant to the problems currently facing the people of Nablus. 27th October: Mohamad Issa was born in Palestine but now lives locally. He is a valued member of DNTA and our committee. You can meet him to discuss the significance of "Being Palestinian". We will be holding frequent meetings for our members to discuss such key issues. 24th November: Anniversary Lecture: Former British diplomat Sir Vincent Fean was British Consul General for the Occupied Palestinian Territories. He is highly knowledgeable about Nablus and Palestine. Join us in Madigan's Food Emporium at 5:30pm on Thursday 27th October for a first-hand insight into being a Palestinian. Not all Palestinians are able to live in their home country so many are living amongst us. Mohamad Issa is one such; he was born in Palestine but now lives locally and is a valued member of DNTA and our committee. We are pleased to welcome him - and you - to an informal discussion about feelings and memories of Palestine. Mohamad is one of several contributors to a recent book "Being Palestinian". You can meet him to discuss any aspects of Being Palestinian. Madigans is at 25 Castle Street, Dundee DD1 3AA (about half way down on the west side) and is waiting to welcome you from 5pm onwards for coffee and cake. The event starts at 5:30pm. Free event, open to all. A date to put in your diary: Thursday 24th November 6:30pm. Sir Vincent Fean was British Consul General in Jerusalem for three years. His talk on "A Just Peace for Palestinians and Israelis?" will discuss supporting a fair future for all. Since retiring, Sir Vincent has remained interested in the Occupied Palestinian Territories. The talk will draw on his experiences as a senior diplomat who was present in the region at a significant time. He has also encouraged universities in the UK to sponsor Palestinians to study here with support from the British Council. Thursday 24th November 2016 6:30pm in Dalhousie Building (University of Dundee) DD1 5EN. Further details will follow. We had a surprise with six visitors from Nablus participating in the Lord Provost's Twinning Weekend. They were treated to a range of events and participated fully. At St John's High School, they gave an impressive display of Dabka (dancing) and sang with great skill and passion. 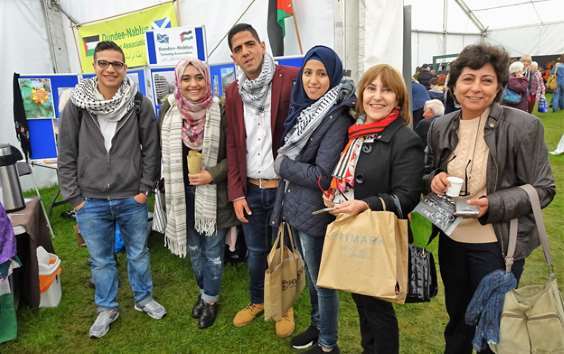 Welcoming them to our stand at the Dundee Flower and Food Festival 2016 gave a rare opportunity to show them how we support Nablus in Dundee. As you see from the photo, they enjoyed their visit. Our stand at the Dundee Flower and Food Festival 2016 was a great success. We won silver! We served over 300 cups of mint tea and people sampled Palestinian olive oil and za'atar. Our displays illustrated life in Nablus. By engaging with those who visited the stand, we could tell them about Nablus and the Association. We also asked them to sign them up for future contact and membership. Thanks to everyone who took turns at the stand and to our many visitors. 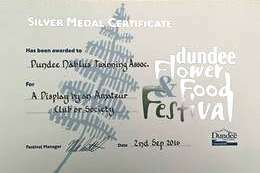 We were pleased to be awarded a Silver Medal Certificate by the show organisers. We really need more help to organise our ambitious programme of activities and events: Palestinian music, Palestinian cookery, Learning Arabic and a series of talks. Sadly, our valued Secretary, Jane Barron, has had to step down because of significantly increased work commitments. This has enhanced our need for more help. So if you can help with specific activities (perhaps you have special interests or knowledge of music or cookery) please contact us. If you are not yet a member of DNTA we hope you will join. And if you are a member, we hope that you are keeping your subscriptions up to date. You can download our membership form and send it to our Membership Secretary Catherine Rice who will help with any questions.